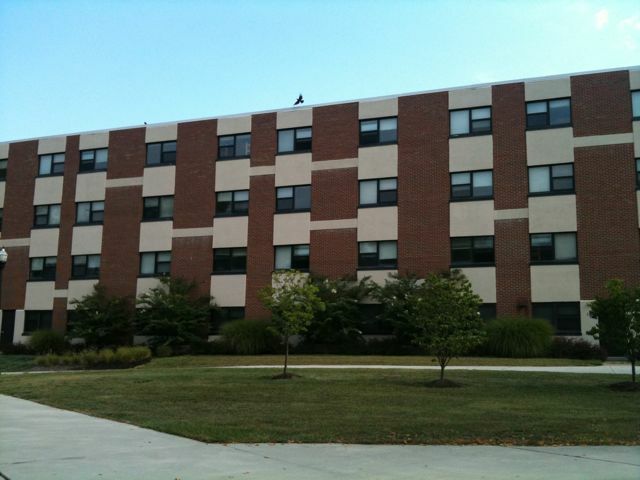 I spent four days last week at Rowan University in Glassboro, NJ at a Summer Camp for aikido practitioners. I had little free time for sketching, etc. related to my quilt art but my mind was never far from my quilt projects. There was a quiet treed place near the gym where I would sit between classes. The last morning as I was missing my Bernina, I studied the building across from where I was sitting. I spied a potential quilt pattern in the design. Soon I was looking at all the surrounding buildings for similar patterns. It goes to prove that you can find ideas anywhere if you look with the eyes of a quilter. 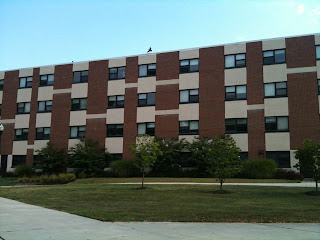 Dorm at Rowan University. Can you see the pattern? That would be YUMMY done in batiks and hand dyes! :) Love this as quiltspiration!